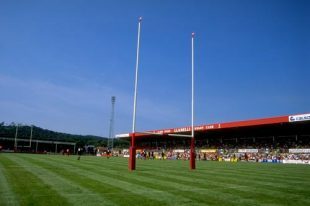 Stradey Park was opened in 1879 as the home of Llanelli, hosting its first international eight years later when Wales played England. It was an inauspicious debut. The England side refused to play on a frozen pitch, so the game was moved to an adjacent cricket field and thousands of spectators in temporary stands were left disappointed. In 1891 the second international, against Ireland, went off without a hitch. The venue hosted many memorable matches, including defeats for Australia (1967) and the All Blacks (1972). It staged one match in the 1999 World Cup. The professionalisation of rugby caused Llanelli financial problems, and in 1997 the ground was sold to the Welsh RFU. In 2008, Stradey Park was sold to developers, ending 129 years of rugby on the site. Llanelli moved to a new purpose-built $45 million venue on the outskirts of town.